Combining television studies, archival studies and cultural history, this thesis asks the question to what extent public broadcasters in the Netherlands are keeping substantive and operational records that would allow for cultural accountability. Because of the unique setup of the Dutch public broadcasting system, there is no centralized archival system for written records of broadcasting organizations. Even though the broadcasters fulfil a central position in Dutch cultural society and provide a public service, they are not legally required to keep the records that give account of their actions and functioning. Only the governing body NPO has to comply with the Public Records Act and is thus required to carry out archival policies. Using a functional approach, this thesis explores the archival practices for written records in the Dutch public broadcasting system by comparing the situation at the NPO to that at the broadcasters. The research is framed in a concise historiographic account of Dutch public broadcasting and its history, followed by an analysis of recordkeeping practices and their purposes within public broadcasting organizations, explaining why archiving public broadcasting is important, even though this is not one of broadcasting’s priorities. At the end, the potential for a heritage institution like the Netherlands Institute for Sound and Vision as a repository for broadcasting’s written records is briefly examined. Snoeren, J.M.C. (2016, August 4). 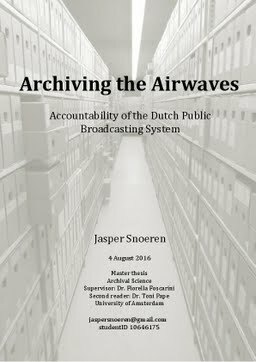 Archiving the Airwaves: Accountability of the Dutch Public Broadcasting System. University of Amsterdam.